This is my ninth post in the Native Trees of Pakistan series. Today, I am featuring the Banyan tree because I believe the series would remain incomplete without the mention of the Banyan tree (Ficus Benghalensis). Banyan, locally knows as Borh, is an important part of the landscape, fiction and life of the Indian sub-continent. It is an important part of rural life; huge Banyan trees spread their wide canopy of wide green leaves over large areas and witness many activities of rural life. A Banyan tree provides a shady playground for kids, a community center for villagers, a sitting and resting place for travellers. It is believed that the name of Banyan tree is derived from the word ‘banya’, which means ‘trader’. In old days, Hindu traders of the Indian sub-continent dominated most of the trade in the region. They used to travel for business purposes and often took rest and do business under this tree. Later, English writers started mentioning Banyan tree as the tree under which Hindu merchants would conduct their business. 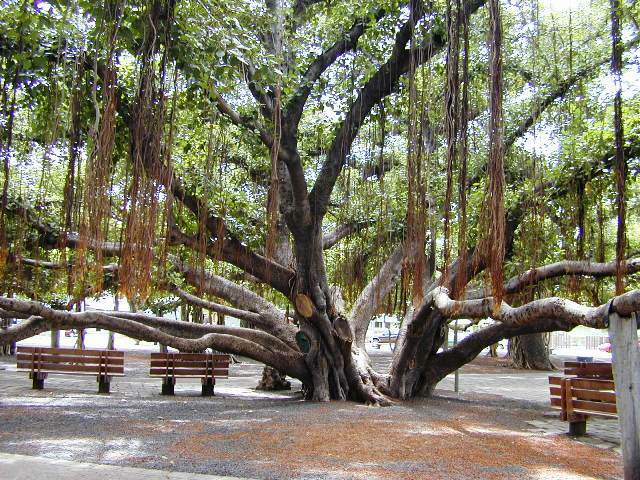 Banyan usually grows as an epiphytic plant – seeds are dropped by birds on a tree or a crack in a building where it starts germinating. Young saplings develop string roots that continue to grow and then strangle the host. 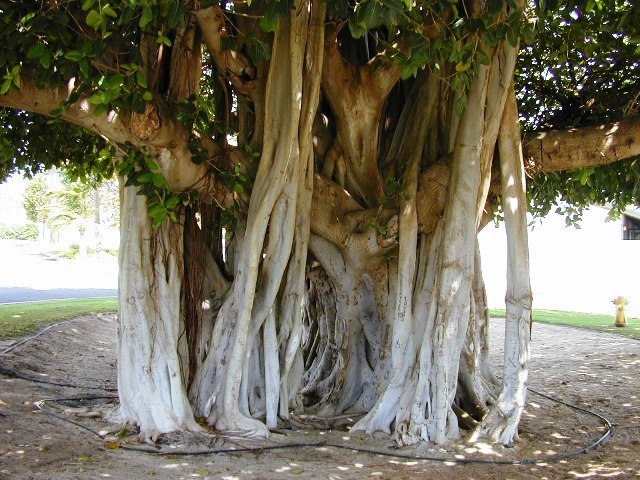 Banyan produces a lot of strong and wide branches that spread far from the trunk and cover a considerably large area. As the tree grows, the trunk gains tremendous width and height. Branches produce aerial roots that reach ground, establish themselves in the ground and ultimately unite with the main trunk. 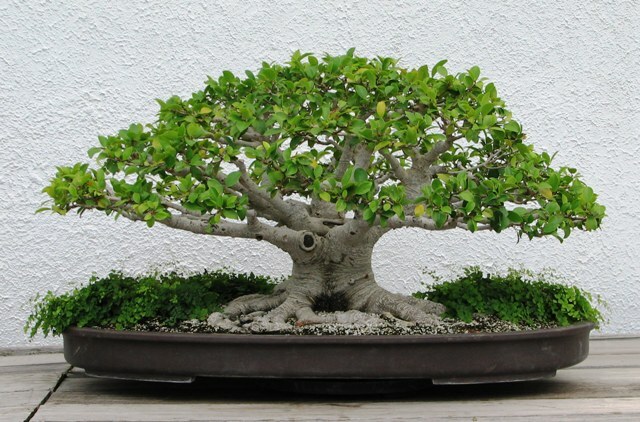 Because of its structure, Banyan makes an excellent bonsai. 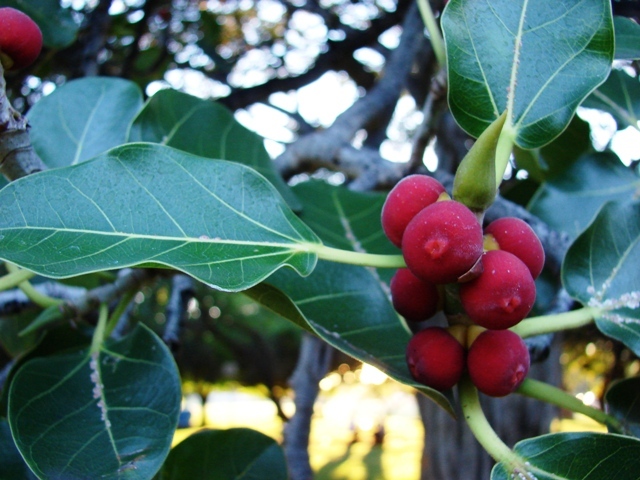 The leaves are large, leathery, glossy green and elliptical in shape. Like most of the fig-trees, leaf bud is covered by two large scales. As the leaf develops the scales fall. Young leaves have an attractive reddish tinge. Apparently, Banyan tree produces fruit but does not blossom but that is not true. The flowers are concealed in the fleshy receptacle commonly known as ‘fig’. These figs are grow in pairs in the leaf axils and numerous, tiny blossoms of both sexes and also a host of small insects. These are the ‘fig insects’ that fertilize flowers. The insect enters the fig through a hole in the top and lays eggs which hatch out and mature. When these insects leave their home, they are dusted with pollen from the male flowers. Now they make their way into another fig, thus ensuring fertilization. The figs ripen between February and May and attract bird and bats. Bird and bats eat these figs and spread Banyan seeds through their droppings. Banyan fruits, leaves, roots and its milky sap are used in many herbal medicines. Medicinal uses of Banyan include cure of biliousness, ulcers, erysipelas, vomiting, vaginal complains, fever, inflammations, leprosy, piles, nose-diseases, gonorrhoea, syphilis, dysentery, inflammation of liver etc. There are a number of huge Banyan trees in Lahore, the city where I live. There are four Banyan trees in the Jinnah Garden. Average height of each of these Banyan trees is approximately 90 feet. One of them covers an area of more than 100 square feet. Other famous Banyans of Lahore are located in Nasir Bagh, Old Anarkali, Minar-e-Pakistan, Borh wala Chowk at Allama Iqbal Road, near Naulakha Church, Girja Chowk, and at G.T. Road near Lahore Fort. Banyan is also an important figure in various cultures, religious mythologies, folklore and literature. In Hinduism, the leaf of Banyan tree is said to be the resting place for the God Krishna, who, after consuming all the universe during the time of destruction, absorbs everything created and turns himself to a child as small as he could fit into the tiny leaf of the Banyan tree and keeps floating in the void space, until he himself decides to recreate everything back out from him – this is equivalent to the pulsating theory and black hole theory that universe expands and contracts constantly. Buddha is believed to have achieved enlightenment while meditating under a Banyan tree. Robinson Crusoe, the famous character of Daniel Defoe, makes his home in a Banyan tree. The Banyan also appears on the coat of arms of Indonesia. It is meant to symbolize the unity of Indonesia – one country with many far-flung roots. I really enjoy your blog. Finally gathered the courage to comment. Uganda has 47 native ficus species and like the Banyan tree, they are surrounded by fables and folklore. I can’t gather the courage to plant them so because they are quite invasive. I had a banyan in a flower pot for a couple of years. I should have put the pot on top of cement, because it broke the pot and went into the ground and now I can’t budge it. The top is taller than my roof and there are branches everywhere. I cut off ten branches to form new trees to grow in pots, and I don’t even miss them. though I read most of the information on wikipedia, the way you put the details of how & where the tree has grown make it very interesting. Also the pictures that support the article are lovely. looking forward to read more from you…. does banyan tree (sour young leave one) bear flower? Yes, it does bloom but the flowers are hidden inside the fruit and are not visible. I am really fascinated to see the banyan trees in Lahore. But unfortunately with the exception of trees of Jinnah Garden, all are shrinking rather dying slowly. These magnificent and majestic trees are the crown of the eco system and biodiversity. We must preserve them at all costs. I am in search of any Boab tree in Pakistan which primarily belong to Madagascar and Australia but despite efforts could not find one here. I have a strong conviction that our rich soil can help grow every kind of trees here. Therefore, efforts should be made by the people at the helm of affairs to cultivate Boab trees in Pakistan. Thank you Noman for highlighting. We are lucky to have a wonderful climate to support a wide range of flora but unfortunately Banyan and numerous other old trees of the city are suffering from all the bad effects of pollution and encroachment causing an irreversible loss to the environment and the whole eco-system.